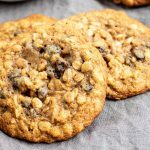 These soft and Chewy Oatmeal Raisin Cookies are an easy from scratch oatmeal raisin cookie recipe made with old fashioned oats, raisins, and brown sugar. In a bowl combine Flour, baking soda, cinnamon, and salt. In the bowl of your mixer cream together butter and two types of sugar until fully combined. Add eggs one at a time followed by the molasses, and vanilla, mixing the whole time until they are combined. Add the flour mixture ½ cup at a time mixing fully in between each addition of flour. Using a spoon stir in the oats and the raisins. Drop the cookie dough by the heaping tablespoon onto a lined baking sheet. Bake for 8-10 minutes. Once done baking let the cookies cool on the baking sheet for 3 minutes then move to a cooling rack to cool completely.